The threat of military force comes after the American embassy in Baghdad's 'green zone' came under a brazen overnight mortar attack last Thursday, which left no one injured but started a blaze near the sprawling embassy's gate. Up to four mortars were fired in what officials confirmed was a targeted assault American diplomatic soil. 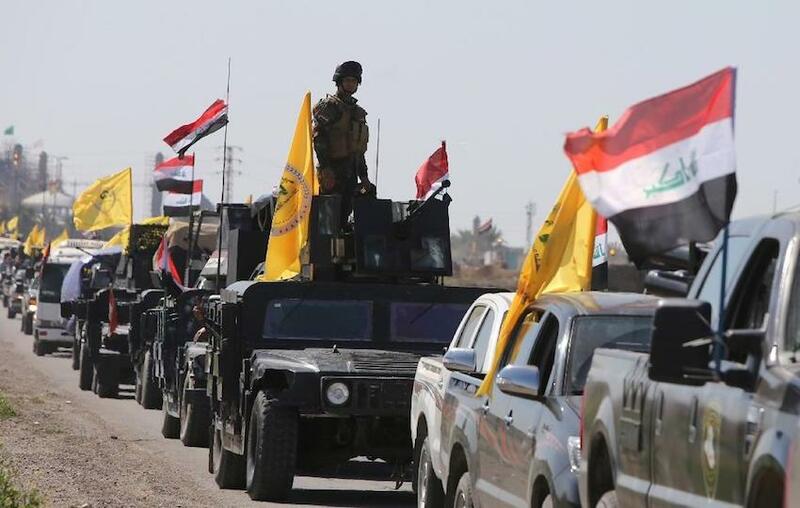 Defense analysts and officials were quick to blame Iran-backed militias in the area, which had previously in the week vowed in a joint statement to expel all "foreign occupying forces" from the country. And days later multiple rockets were fired at the Basra airport, which is also site of the United States consulate for the area. Though denying it had a role in events in Basra or Baghdad, Tehran's leaders did admit to a major missile attack on the headquarters of the Kurdistan Democratic Party in Northern Iraqi Kurdistan, which resulted in up to a dozen killed and scores wounded. The White House statement, which condemns "life threatening attacks" against "the United States consulate in Basra and against the American embassy compound in Baghdad" also follows two weeks of heightened sectarian tensions across various parts of the country, but especially the southern Sunni-majority city of Basra, where the Iranian consulate was burned to the ground after it was stormed by a mob late last week. The statement puts Iran on notice and pledges that it will be held responsible for such incidents: "Iran did not act to stop these attacks by its proxies in Iraq, which it has supported with funding, training, and weapons," reads the press release. US officials have yet to reveal any evidence that Iran was directly behind either the embassy or Basra consulate attacks, but days prior ten pro-Iran Shia militias in the country published a statement vowing to expel foreign troops and advisers by force if they didn't immediately leave Iraq. The statement first published last Tuesday further declared there was an “Anglo-American-led dirty and dangerous conspiracy to impose a devilish coalition” on the people of Iraq which seeks to weaken the government and make Baghdad a puppet of Brett McGurk, who is the White House appointed special envoy for the anti-ISIL coalition. The Shia militias later blamed Washington for being behind the mass anti-Iran and anti-Iraqi government protests that engulfed Basra and resulted in the Iranian consulate being burned down along with dozens of Shia militia headquarters and other facilities across the city. “The American Embassy is directing the situation in Basra,” charged Abu Medhi al-Mohandis in public statements. Mohandis is a well-known Shiite militia commander who U.S. officials accuse of long being on Iran's payroll. All of this also comes after allegations that Iran has transferred ballistic missiles to its proxy forces in Iraq, which are said to be easily capable of hitting Tel Aviv and Riyadh, according to Western and Iraqi intelligence sources cited in a recent Reuters report. Given current broader tensions in the region and charges of "Iranian expansion" it will be interesting to see if the US again ramps up operations in Iraq. Should the proxy war waging across the border in Syria actually come to an end, it may very well be that Iraq again becomes the new ground zero for the West's anti-Iran proxy war.